Encouraging women into TAFE to learn trades could help fill major skills shortages in regional Australia.Yet despite major efforts from government, industry and education providers the number of women in the manual trades in Australia has barely shifted over the past 20 years. 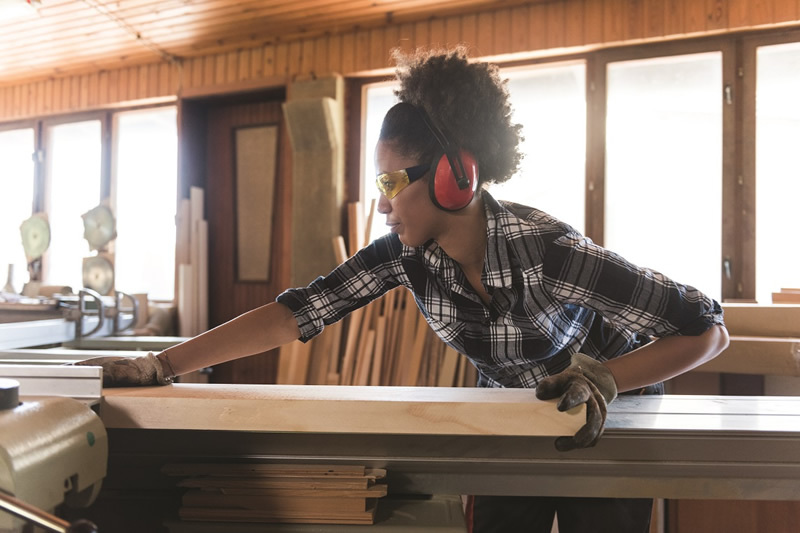 Emerging preliminary research from Charles Sturt University is revealing the factors that support and facilitate the success of women in manual trades in regional Australia. The research team is led by Dr Donna Bridges and includes Dr Stacey Jenkins, Dr Larissa Bamberry and Associate Professor Branka Krivokapic-Skoko. This team of researcher spoke to employers, trades women, job network agencies, education providers, government, councils and trade unions in New South Wales to understand the barriers to recruiting and retaining women. So why don’t women want to become apprentices? The harsh reality is that recruiting women is difficult. The world of work is gendered terrain where cultural norms dictate which jobs women and men should perform. Quite simply, trades are seen as a masculine occupation by women. They don’t associate manual jobs as one suitable for them and don’t have female role models to look up to, or to visit them in schools. Influenced by these gender norms, families are dissuading girls away from taking up trades in a bid to protect them from working in a male dominated environment. Partly because they want to protect them from heavy lifting and dirty work, but also to protect them from fears of sexual harassment, or worse. To compound this, schools reinforce the gendered norms with some school career advisors considering manual trades to be masculine professions and only offering information to boys rather than encouraging girls to consider them as an option. Olivia Brown, AEU Federal Women’s Officer and a former TAFE student, believes that we need to see a cultural shift in society. ‘"We need to actively engage women, especially young women, with the premise that they are both equally capable of achieving success in technical careers, and that the indicators of that success are not inherently of a gendered nature whatsoever.To overcome previous social norms which have previously repressed women from high-skilled technical work, women must be encouraged and exposed to technical skills at a young age, both within the family home and with various opportunities during their education at school.I found during my time running a technical trade camp for high school girls, many were surprised at their natural technical ability, and were then able to correlate success, enjoyment and satisfaction within a technical field of work, something they would never come to realise without such exposure." Masculine cultures can be resistant to diversity and by implication change and many women reported being expected to fit into dysfunctional male-dominated cultures. The resistance to including women manifests in bullying and sexual harassment causing women to drop out, or if they report it using appropriate channels, they can become ostracised or victimised. The researchers found that while the deliberate use of foul language is acceptable to women in many instances, vulgarity and sexist slurs focused on individuals is not. Many women reported being told to ‘toughen up’ and not cause too many problems. They were told they were too ‘prickly’, too easily offended, or too thin skinned which ultimately lays the blame on individual women as being the problem and takes the emphasis off a dysfunctional culture. “The women who were mature in age in the classroom noted they felt their age and life experience helped them in being resilient and dealing with the disruptive and sometimes sexist and inappropriate behaviour of the younger males. There was some discussion offered from them that it would be useful if consideration could be given to trying to ensure that if there were other females doing the same trade, that the training provider should try and ensure that they be placed in the same classroom, as a support for each other, as otherwise they could feel quite isolated” she said. Isolation also led to women feeling they were being scrutinised under an uncomfortable spotlight. The spotlighting phenomena can also cause women to feel as though they need to out-perform their male colleagues in the amount of work they do and how well they do it. The pressure to perform is compounded further by being in the spotlight, not only for oneself but by representing all women. Women tradies felt because the industry has so few women, those that are visible establish a benchmark. Therefore, they felt that if one woman’s performance is poor, the perception of all women’s capacity or performance is damaged. Damaging rumours or ‘jokes’ that women only acquired their job through ‘sexual favours’ are also extremely detrimental to the self-esteem of women and workplace relationships between women and men, ultimately leading to concerns about workplace safety. While there clearly needs to be an increase in diversity and a change in culture, Stacey Jenkins concluded ‘On a positive note one of the tradeswomen noted they still rely on their TAFE teacher as a mentor and is in regular contact with him, which she has felt has been very valuable.’ Indeed, mentoring, buddy systems, all women teams, networking initiatives and using social media were all seen as effective ways to break down barriers. TAFE NSW in the South region has piloted several female mentoring programs with positive outcomes. Discussions also highlighted how successful community education and awareness programmes, which focused on early engagement with girls can help to ‘normalise’ women tradies. Examples include Women’s Sheds; Supporting and Linking Tradeswomen (SALT) a not-for-profit network of female tradies that began with seven tradeswomen in Wollongong in 2009 and now has representatives nationwide, and a programme where women ‘on the tools’ share their experiences with school children and women in the community. The researchers believe TAFEs can make an important contribution to developing support and retention strategies in male-dominated trades by recognising young women’s existing levels of resilience, and building in skills training for all qualifications in the areas of resilience, adaptability, team work and communication. While more research needs to be undertaken to determine whether there are differences amongst the regional areas, it is clear that targeted actions are needed to achieve sustainable social and cultural changes for women in the trades. Changes that not only benefit women and men but build skilled communities and a global future for regional Australia.